Walt Disney World is said to require an equivalent level of infrastructure to a city with a population of around 300,000 people. The huge number of staff and visitors that are on site at any one time do, naturally, need to visit the restroom occasionally. And something has to be done with all that sewage. The solution? The Reedy Creek Improvement District operates its own wastewater treatment plant, which is so effective that the resulting water is actually safe to drink. Instead of serving it up to customers, Disney instead uses it to irrigate landscaped areas, such as golf courses, lawns and flowerbeds. 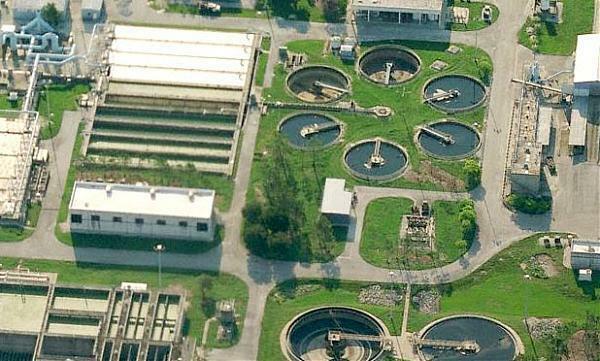 The plant can handle up to 15 million gallons per day, while an effluent disposal system features a 1,000 acre site containing 85 rapid infiltration basins and a reclaimed water system that can handle demand of 5 million gallons per day. Waste water and garbage aren't the only things recycled by Walt Disney World. A huge composting facility mixes waterwater biosolids, wooden pallets and trash wood products, along with food waste from the resort's many restaurants. The resulting compost is used to fertilize the resort's grounds. Naturally, Walt Disney World needs a lot of clean water - and an enormous supply and distribution system fulfils this need. This includes 11 Floridan Aquifer wells and four pump stations, designed to distribute up to 60 million gallons per day (the average daily demand is 14 million gallons). Five above-ground water storage tanks can be used to augment this system, with a combined capacity of 7.95 million gallons. Chilled water is provided for the air conditioning systems that are located all over the resort. This is generated by using 22 centrifugal chillers, and one absorption chiller, which are spread across three facilities. A five million gallon thermal storage facility helps to store this essential resource. Hot water, meanwhile, is partially generated using excess heat from the on-site power plant. The rest is heated using three gas-fired generators. When Walt Disney World was first built, Central Florida lacked many of the facilities that would be needed to run the massive resort, so Disney simply built them itself. Many of them are located at Central Shops, north of the Magic Kingdom. This is capable of fabricating everything from trash cans to ride vehicles, and is divided into sub-areas such as the Metal Shop, Maintenance Services and the Paint Shop. There are more than 2,500 Cast Member costume designs in use at Walt Disney World, with a total of around 1.8 million pieces in the extensive wardrobe. Roughly 13,000 pieces are manufactured every year. Mickey Mouse has almost 300 different outfits, while Minnie has more than 200. That's a lot of laundry. When Walt Disney World opened, it featured the world's largest laundry facility. And in March 2014 it began the construction of a new, state-of-the-art facility that is scheduled to open in spring 2015 and is expected to create 200 additional Cast Member jobs. It will be the fourth such facility on-site. "The new facility will showcase some of the textile industry’s most cutting-edge features including conveyors and air suction tubes that quickly move linens and machines that automatically sort, separate and fold," said J.R. Garcia, director of textile services at Walt Disney World Resort. A few miles away from the wastewater treatment plant is Walt Disney World's tree farm, where horticulturists tend the thousands of plants that are needed to landscape the resort. The resort features plantlife from every continent except Antarctica, many of which require three years of acclimation to Florida soil before being planted "on-stage". Want to get a glimpse behind the scenes at Walt Disney World or another Disney resort? Check out the range of tours that are on offer in this article.